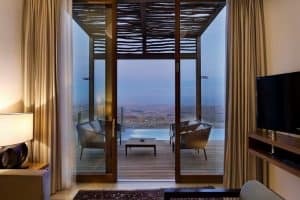 The Beresheet Hotel is set on a cliff at the edge of the Ramon Crater in Mitzpe Ramon. Featuring characteristic stone walls, it offers luxurious rooms with free Wi-Fi, a balcony and panoramic views.The elegant rooms come with a flat-screen TV, a coffee maker and a seating area. Bicycles and segways can be rented on site. The restaurant features large glass windows that offer lovely views of the surroundings. The property also features a wellness centre and a summer outdoor pool. Providing free private parking, The Beresheet Hotel By Isrotel Exclusive Collection is 22 km from Avdat Archaeological Site. Sde Boker is a 30-minute drive away. Two rooms are adapted for disabled persons. This property also has one of the best-rated locations in Mitzpe Ramon! Guests are happier about it compared to other properties in the area. This property is also rated for the best value in Mitzpe Ramon! Guests are getting more for their money when compared to other properties in this city.